Tagged with " National Take Your Cat to the Veterinarian week"
(THE COMFY SOFA, My House, Annapolis, Maryland) August 14, 2012—Saturday marks the beginning of National Take Your Cat to the Veterinarian week, and to celebrate, I thought I would share tips on making the trip to the veterinarian more pleasant for everyone. I’ve said it before, but just in case you missed it, I will say it again. Get your cat to like its carrier. It can be done, and your cat will thank you for it because it will give him an additional place to snooze. My carrier is always left out and open with my favorite blanket it in, and I can frequently be found napping inside. 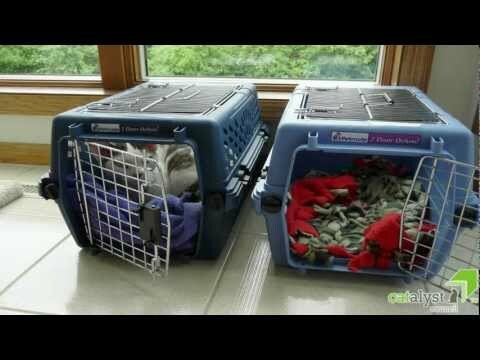 Check out this video to learn what else you can do to help your cat get over its fear of the carrier. You might want to consider finding a cat-friendly veterinarian. The American Association of Feline Practitioners has developed a program that certifies veterinary practices as “cat friendly,” and has a list of them on their website. I love my cat-friendly veterinarian! She knows that I want to stay in my carrier if at all possible when she is examining me, and the waiting rooms at her practice are segregated by species so I don’t have to come nose-to-nose with a curious collie while I’m waiting to see her. Make the trip fun. I love hearing how wonderful I am. Even better, I love it when you pet me and reward me for how wonderful I am. Tell me and show me frequently during the trip that I am the most amazing creature in the world for putting on my brave face and allowing my schedule to be disrupted for a trip to the veterinarian. I’m a complete sucker for that. Your cat is an important member of your family – I know I am — and, as such, needs regular preventive health care, no matter how much he or she may protest. Did you know that dental disease affects 68% of all cats over the age of three? That most cases of diabetes could be prevented if the 53% of cats that are overweight were on the proper food? A simple checkup can help detect and treat preventable diseases and conditions that can cut a life short. Yikes! It hurts to even type that. The CATalyst Council is a national organization which includes a wide variety of animal health and welfare organizations as well as corporate members of the animal health industry that are working together to improve the health and welfare of America’s favorite pet. It was founded in response to troubling statistics released by the American Veterinary Medical Association that indicate an increase in our nation’s pet cat population coupled with a decline in veterinary care for those cats. More information about the CATalyst Council is available at catalystcouncil.org. For more information on CAT Stanley, including how he got his name, visit his section on the CATalyst Council web site.